The Critter Capital of the World, a Muck Diving Mecca and the Twilight Zone are just a few of the names that have been given to Lembeh over the years due to it’s high density, and diversity, of rare and unusual marine life. Diving in Lembeh is unlike diving anywhere else as every dive reveals countless species of critters which have made their homes here on Lembeh’s famous muck diving slopes. Our Critters at Lembeh Resort dive guides are experts at spotting the unique marine life which resides here. Lembeh isn’t just home to frogfish, it’s home to 8 different species of frogfish, 12 species of octopus, numerous crustacean species that cannot be found anywhere else on earth, 3 species of pygmy seahorse, countless numbers of nudibranch species and new discoveries are continuously being made. Some of Lembeh’s most iconic species include the Hairy Frogfish, Pontohi Pygmy Seahorse, Wunderpus, Mandarin Fish, Mimic Octopus, Rhinopias Scorpionfish, Flamboyant Cuttlefish, Blue Ring Octopus, and the list goes on. Take a look at our Critter Log to see the weird, wonderful, and bizarre species that await you – there are simply too many to list here. For more experienced divers, the exhilaration of making “special finds” for yourself gives a rush of adrenaline that can’t be matched. And for underwater photographers, a great photograph speaks many millions of words. 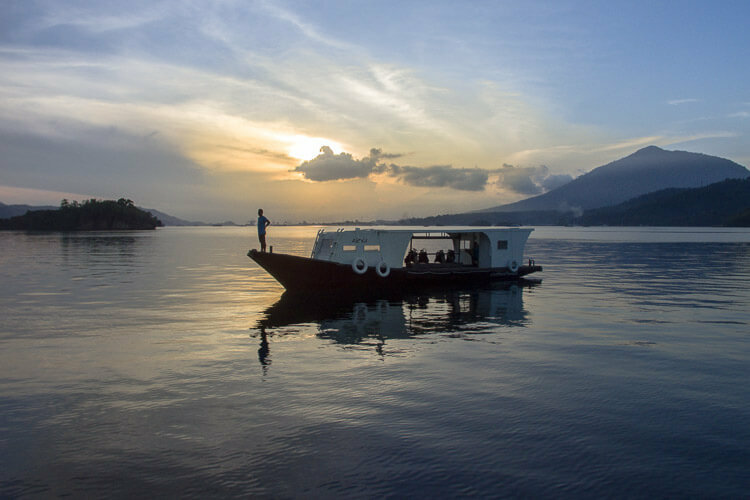 Join us for a two or three dive day trip to discover the rich and vibrant coral reefs which surround Bangka Island, the north end of the Lembeh Strait and the east coast of Lembeh. 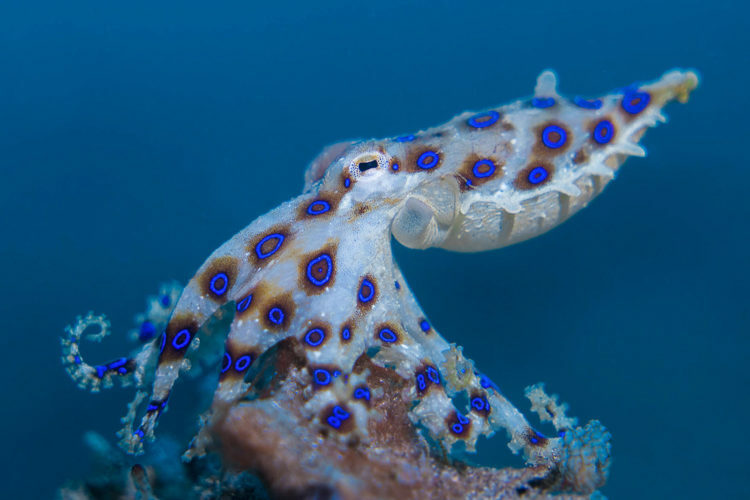 These lesser known dive sites are teeming with life and bursting with kaleidoscopic colors. Watch out for passing pelagics! The Lembeh Strait is recognized by marine biologists as having the World’s highest concentration of rare and unusual marine life. Critters at Lembeh Resort dive guides are all marine biology and underwater photography trained to ensure you experience the best of diving in Lembeh. Join Critters at Lembeh Resort for a night dive: For some of the unique marine creatures of the Lembeh Strait the action is just getting started when the sun goes down. Dusk or night diving in the Lembeh Strait is a must for anyone who wants to see some of Lembeh’s nocturnal critters. Air Bajo is one of the premier muck dive sites located on Lembeh Island. In Indonesian, Air Bajo means Sea Gypsy. Air Bajo is a large area that is broken up int three dive sites. Each of the three sites begins with a shallow sandy flat 4-6 m deep, then a gentle sandy slope to a depth of 20m where the bottom gradually flattens out. “Air” means water and “Prang” means war. Air Prang was named after the jetty offering fresh water from an uphill aquifer, installed by the Japanese during WW2. Air Prang is a large, spread-out gradual sandy slope, which is popular for night diving but also potentially great during the day. A twin-peaked coral pinnacle comes within a meter of the surface. A large cave offers a swim-through for divers on the deep end of the pinnacle. This site got its name from the sunlight that shines through the cave opening in the early morning. One side is a coral slope leveling out onto a sand flat at 15 meters and on the other side is a wall to a shelf at 8 meters, then a small plateau and another drop-off, down to 20-32 meters. Next to a pearl farm, this site has a verdant mix of coral and sponge growth in the shallows with a sandy slope below. The first divers to explore this site proclaimed “Aw Shucks!” after they found a lot of critters during their dive. Snorkeling can also be done here. This is a sheltered series of lava bowls offering good hard coral growth (especially lettuce corals) in shallow depths, no current and visibility better than anywhere else in the Strait. The dive site is named Batu Angus because “Batu” means rock and “Angus” means burns, signifying the hardened lava rock in the water. Although there are few schooling fish, this is an excellent place for snorkeling. For divers this site is known for mandarin fish, which can be seen mating and fighting at dusk. Description: In Indonesian, “Batu” means rock and “Kapal” means ship. From a distance, the rocks of this site resemble a ship. These rocks are a set of pinnacles off the northern tip of Lembeh Island. This is the best big fish dive in North Sulawesi, but severe multi-directional currents prevent all but only the most experienced divers from venturing there. Turtles, white-tip and grey reef sharks, as well as eagle rays are also sometimes seen. In Indonesian, “Batu” means rock and “Merah” means red, as this site has a red tint to the slopes. This site offers two dives: a rich coral slope or a steep sandy slope with coral bommies and a sunken fishing boat. There is much to see here. A cleaning station at 24 meters is a focal point, but there is a wide array of nudibranchs, pipefish, crustaceans, and cephalopod species. In Indonesian, Batu Sandar means Leaning Rock. The dive site is named after a rocky pinnacle that leans above the water. A finger of shallow hard coral extends out into the Strait down to 20 meters on a white sandy slope. Sheltered shallows have excellent soft coral and sponge growth, and the deeper flat sand has many scattered coral bommies. A good site for Pygmy Seahorses in the 20-25m depth range. The shallows are good for snorkelers. This dive site is beside police pier 2 so it is quite similar to Police Pier 2. A sandy and rubble slope with soft coral area with many orange sponges, as well as a small muck area. “Pantai” means beach and “Kecil” means small, so this site is named after the nearby beach, which is very small. This stunning site is a seamount out from the island of Pulau Putus. It features twin coral peaks with a sand flat in between. The shallows are good for giant frogfish and tiny boxer crabs. The coral slopes down on either side, but the most exposed section is a series of steps formed by boulders and sand shelves which descend into the depths. A kaleidoscope of soft corals make this Lembeh’s most colorful dive site. Large mackerel and tuna pass by and the scenery is a big draw. This dive site has a self-explanatory name – it is a lovely dive site, which offers some spectacular critter hunting. It has a nice and healthy reef in the shallows with many different species of anemones. A little bit deeper, there is a gentle rubble slope. Patches of coral rubble, goniopora and alvepora corals live at around 22 meters. Description: This site is named after a dive guide named Dante. At the very northern tip of Lembeh Island, this dive site has a beautiful wall going down to 30-35 meters, covered in black corals and sea fans. Where the wall ends at a slope, in the shallows there is small opening to a huge cave with shrimp, lobsters, and flashlight fish. This site is named for the extensive variety of gobies and crabs that can be found there. One of the few dive sites situated far south in Lembeh Strait. Excellent coral growth in the shallows, with a steep white sandy slope below. Visibility is generally better than in the middle of Lembeh Strait. A good mix of muck and coral species. This is one of the most famous of the muck sites in the Strait. The sandy slope here is exceptionally rich. The position on a point means that the mix of currents brings more nutrients than on most other nearby sites. A sandy slope to 30 meters with scattered reef in the shallows and at the far north end of the dive site. When first exploring this site, three divemasters; Terry, Ronald and Nus were trying to come up with a name when Terry said, “What about Hey, Nus?”. And that is how it got its name. It is a muck site with a gentle sandy slope that drops down to coral patches in about 14-20 meter depth. There are lots of scattered Physogyra corals and rope sponges along the slope. A muck site that can be exceptional rich in critters. Coral patches on the shallow sandy flat to about 5 meters depth and a black sandy slope that continues down to 28 meters. Few concrete blocks that the mooring line is attached to and some sponge areas along the slope attracts a lot of interesting finds. A wall dive, this is a good spot for pygmy seahorses and other small critters. There is a slight overhang at the dive site and the scenery is the main draw. A wreck dive in the central Strait. Kapal Indah was a large fishing trawler that now rests upright on a 30m sandy bottom. The main deck of the wreck is at about 20m. Shoreward of the wreck, a rubble slope rises to the shallows providing a good place to finish off the dive looking for small critters. “House Reefs” are traditionally located in front of the resort. The house reef is a shore dive, which can be dived any time. A sand and sea grass bed in the shallows at 2-7 meters leads on to a slope from 8-15 meters depth. Maximum depth is 25 meters. The substrate is mostly sand with colonies of corals and rubble areas at 7-8m. At 15 meters there are “reef balls” – artificial reefs which attract additional life. The house reef can be easily self-guided by means of a buoy system, which starts from 2 meters, continues down to 15 meters and brings you right back to shore. A southern muck site, this is a shallow (2-3 meters) flat sandy area leading to a slope down to 20+ meters where the bottom reminds you of the craters of the surface of the moon. All sand. A cargo ship had been sunk on the shallow sandy flat. A bit different from sand sites within the Strait, it is hit-and-miss here, but there can be an exceptional variety of venomous fish, and pipefishes and their relatives. The site is named after the nearby village. A continuance of the gentle sandy slope, the highlight of this dive is a coral and rubble patch stretching from 12 – 27 meters and is a good place to find thorny seahorses. In the shallows towards the bay is sand, but there is a healthy hard coral garden to the side, stretching southward out of the bay. The Makawide sites are named after the nearby village. Excellent coral growth in the shallows and a rubble and sand slope. Makawide 2 has a pair of pinnacles, and is an excellent site for cephalopods and nudibranchs. The shallows are good for snorkeling. The most popular wreck in the Strait, this huge WW2 Japanese freighter lies on her port side, offering a coral-encrusted oasis. Mawali is the name of the nearby village. Nudi Falls is named after the fact that the bubbles from the divers sometimes cause nudibranchs to fall off the wall above and drift down. One of the most popular sites in the Strait. It consists of a beautiful sheer wall with a rocky slope below, then a sandy slope, levelling out into the main channel of rubble sprouting a deep forest of large soft corals. Scenically, this site is unlike any other in the Strait. One of the most heavily-dived sites in the strait, this is a lovely coral bowl in the shallows, turning into a sandy slope with encrusted boulders down below with two mini walls stretching out to either side, sporting healthy soft coral growth right up to only 2 meters in depth. The prime attractions here are pygmy seahorses and sea moths along with the attractive underwater scenery and general variety. Nudi Retreat is named for the large variety of nudibranchs that can be found there. When the visibility is good and a bit of current is running to open up all the soft corals, Nudi Retreat is a good Wide Angle dive. “Pantai” means beach and “Parigi” means well, so this site is named after the fresh water well on the nearby beach. 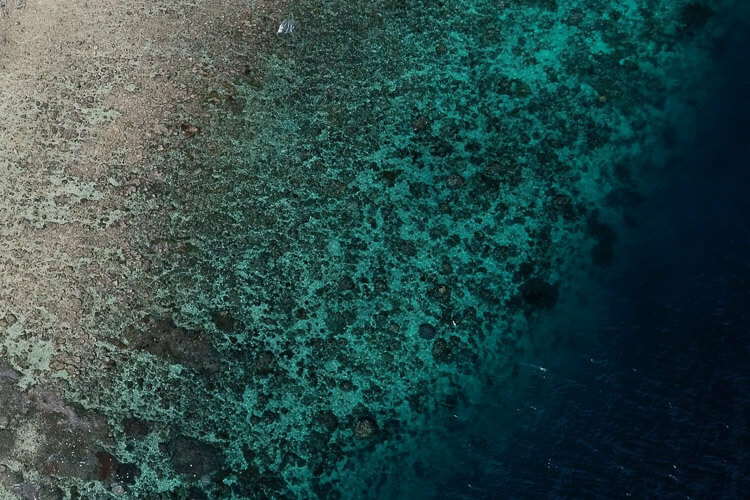 A white sand muck site with healthy and dense coral cover in the shallows, then a gentle white sandy slope that is a good alternative to the predominantly black sand in the Strait. A 5 minutes trip away from the resort, this site has a coral area in the shallow parts around 5 until 7 m. It continues with black sandy slope until 20 m and rubble in the deep area. This is a nice site for night dives. “Pante” means beach and “Abo” is the name of a local girl who passed away near the site. A sandy slope that leads into a beautiful sheer wall, which progressively becomes deeper. The wall is covered in whip corals, gorgonians, sponges, and soft corals. It usually has good visibility. “Pantai” means beach and “Jiko” means bay, as the site is named after a small beach on the bay in which it lies. This dive site has a ridgeline of shallow healthy coral and a gentle white sand and rubble slope down to the 25m depth. This site is also the location of the evening Mandarin fish dive. The shallow corals are good for snorkelers. To the right side of the resort, this site has a nice coral area surrounded by black sand and coral rubble. “Pintu” means door or gateway, “Kota” means town, and Kecil is the name of the nearby village. This site is located to the left side of the resort. It is a rubble slope with a lot of halimeda algae. A sand and rubble slope with soft coral area with many orange sponges, as well as a small muck area. There are some pearl farm shacks on stilts in this site – a lot to see under the shack. Police Pier 2 is named for its proximity to the pier of the police station that monitors Lembeh Strait. A nice coral site in the middle section of the strait. Large barrel sponges, porites boulders and patches of halimeda algae in the shallows and large quantities of seafans further down the current exposed slope. A small island off the southeast coast of Lembeh on the open ocean side of Lembeh Island. This dive site features a slope with fingers of reef down to 30 meters. Good visibility, although can be subject to strong current, attracting the bigger fish. A beautiful coral and sponge garden in a sheltered bay. The scenery itself is the highlight, though larger rays (devil and eagle rays) are seen from time to time. Another black sand site, but with a small stand of healthy coral in the shallows. ROJOS is named for our dive guides and crew that found the site while exploring. This includes Ronald, Opo, Joni, Ona, and Salmon. The site is a mix of coral, sandy slope, and sandy bottom. This site is near a pearl farming area. This site is at the Sarena Island group in the center of the strait. Since it is located at the “big” island, and the word for big in Indonesian is “Besar” the site is called “Sarena Besar”. The site is a combination of coral, rubble area, and a sandy bottom. In the shallow, there is some nice coral area, whereas the deep area is sandy bottom. A sloping sand and rubble area near one of the smaller Sarena islands. A gentle sandy slope of black sand with some rubble and a single bommie that can harbor numerous ornate ghost pipefish at times. This dive site is named after the nearby village and means ‘deer horns’. It is a gentle sand and rubble slope. This site is named after the cemetery in the nearby village on the cape, as “Tanjung” means cape and “Kubur” means cemetery. A slope with nice hard corals in the shallows down to 15 meters, leading on to sand and rubble with small reef patches to 30 meters. “Tanjung” means cape and “kusu-kusu” means tall or wild grass, so the dive site is named for the tall grass growing on the cape near the site. A shallow coral/rubble site with a residential population of mandarin fish. A good place for dusk dives to observe courtship and mating behavior of this elegant fish. This stunning site offers huge boulders, creating canyons and shelves which stretch well out into the Strait. Strong currents are usually found here, demanding planning for slack tide. “Tanjung” means cape and “Tebal” means wide or thick, so this dive site is named for the thick part of the cape on which it lies, as seen from above. ATK 1, 2 and 3 are short for Teluk Kembahu. “Teluk” means bay and Kembahu is the name of the nearby village. An excellent muck site with a sandy slope that starts at 5 meters and continues down to about 22 meters. Patches of rope-sponges attract various marine life as well as some small coral bommies in the shallows.